Catch the Excitement! Cruise into Nantucket Sound and find yourself in one of the best areas for fishing on the East Coast! Whether your choice is bottom fish or blues, we have everything you need to take part in the action...all you have to do is show up! Introducing the 50' – 20 person “Monomoy”. Great for family and friends looking for private gatherings of more than 6 people. Your personalized excursion can be aimed at fishing, whale watching, sunset cruises and/or a ferry to the islands. Multi-location pickups can be arranged for private charters departing from Falmouth, Barnstable, Chatham,... show more Introducing the 50' – 20 person “Monomoy”. Great for family and friends looking for private gatherings of more than 6 people. Your personalized excursion can be aimed at fishing, whale watching, sunset cruises and/or a ferry to the islands. 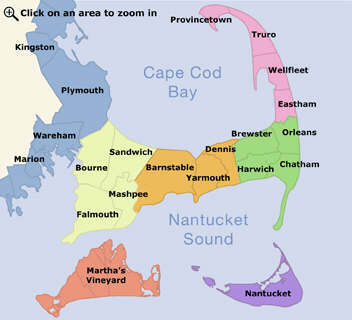 Multi-location pickups can be arranged for private charters departing from Falmouth, Barnstable, Chatham, Nantucket and Martha’s Vineyard. Looking for that private charter atmosphere? The Monomoy also sails open boat on 4 Hour Fishing and 2 Hour Kids Sea-Fari trips, departing from the Bass River Marina in West Dennis.